Forbes Includes List of Smartphones That Emit The Most Wireless (WiFi) Radiation -- This Won’t Help Much When 5G Cell Towers Are Installed All Over The U.S.
Forbes magazine contributor, Niall McCarthy, was not correct when he stated that there was no conclusive scientific research on the impact of cell phone radiation. He also didn’t include the fact that The World Health Organization classified cell phone radiation and other sources of wireless (WiFi) radiation as a Possible Carcinogen in 2011 AND that many scientists believe there is enough research that proves it should be re-classified as a Carcinogen. He also didn’t mention that a 2011 study by the National Institutes of Health revealed that radiation increases the activity in brain cells after just 50 minutes on a mobile phone. Lastly he didn’t mention that in 2012, researchers also determined that cell phone and wireless (WiFi) radiation disrupts the Blood-Brain Barrier which may cause it to leak. The Forbes article is important, though, because it includes a list of which smartphones emit the most radiation for those who are concerned about this. Over the years, in-depth articles about research on exposure to cell phone and wireless (WiFi) radiation and other sources of Electrical Pollution (Electrosmog) has been published by many media sources including GQ magazine and NBCNews.com. If there was truly no reason to be concerned about exposure from cell phone and wireless (WiFi) radiation-emitting products, there would be no need to test them and include safety guidelines with product manuals. Federal guidelines and testing for cell phones and other personal wireless (WiFi) radiation-emitting products were created over 20 years ago for adults – not children. People of all ages now use cell phones and wireless (WiFi) radiation-emitting products. People of all ages are now exposed more often to these types of products from others using them – except for Silicon Valley parents who have been limiting their own children’s use and exposure for many years already. There are more sources of cell phone and wireless (WiFi) emitting radiation and electrical pollution (Electrosmog) than ever before (cell phones, cell towers, computers, utility “Smart” Meters, WiFi routers, etc.). No safe level of radiation seems to have been determined for animals either probably because they don’t use cell phones, etc. However, many humans use cell phones and other wireless (WiFi) radiation-emitting devices around their pets. WiFi is even installed at many nature preserves and wildlife sanctuaries as well. Many assume that these products are harmless because they don’t come with very obvious warning labels like what appears on packages of cigarettes. In Berkeley, California, the court system has ruled in favor of more obvious warning labels for the sale of cell phones. Telecom companies continue to appeal the decision. Utility companies all over the world have been insisting on installing wireless or digital “Smart” Meters on all homes and buildings. They are not required to provide customers with guidelines or manuals even though these meters also emit wireless (WiFi) radiation. 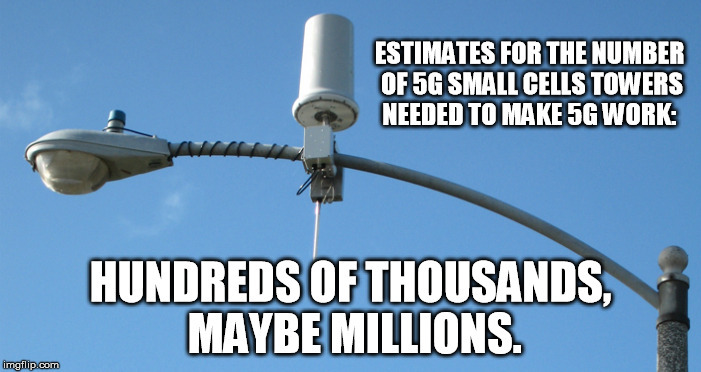 Recently Dr. Oz featured a segment on his show about telecom companies and U.S. elected officials insisting on installing 5G small cell towers every 500 or so feet along residential streets and throughout business districts including in front of homes. Many municipal governments and American citizens are trying to stop this in their communities. Because of legislation and regulations established 20+ years ago, Americans have already been limited in how to stop cell towers and other wireless infrastructure from being installed in their communities. New laws created for these 5G towers have eliminated municipal authority almost entirely. 5G enables us to binge watch, surf, and post online at super-fast speeds without the threat of being disconnected or our screens freezing up. This is being marketed as “a race we need to win” to ensure that the U.S. will be successful and revered by others all over the world. Are you also thinking that this is beyond twisted? In the meantime, media sources like CBS, Consumer Reports, Forbes as well as medical associations like the American Academy of Pediatrics will continue to provide us with tips on how to reduce our radiation exposure from personal devices. Unfortunately no one will be able to advise us on how to reduce radiation exposure from 5G towers because it seems that eventually they will be everywhere – at least in the United States. “CBS News Posts 8 Dumb Ways to Boost Possible Cancer Risk. Experts Still Not in Complete Agreement. 1 Comment on "Forbes Includes List of Smartphones That Emit The Most Wireless (WiFi) Radiation — This Won’t Help Much When 5G Cell Towers Are Installed All Over The U.S."